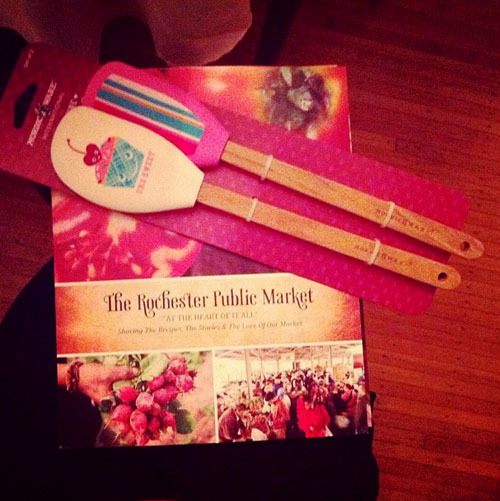 Some of the goodies I got for Valentine's Day... a Rochester Public Market cookbook and cute spatulas. I am very excited to try something from the cook book. I also hear rumors that there will be a food truck rodeo at the Public Market! I'll keep you apprised of that development. 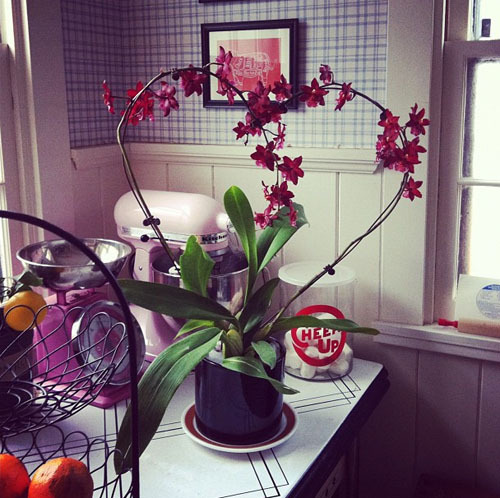 For flowers I got this amazing heart orchid. Gah! So cool! I am trying my Grandma's trick of watering it by placing ice cubes in the pot to melt. It might seem like a bad idea knowing that orchids like warm conditions, but my Grandma's orchids are amazing. They look like they could walk out to the kitchen and fix themselves a snack... so I'm giving it a go! we have food truck festivals here in Denver in the summer, they are awesome!! that orchid is lovely. Megan gave one to me last year at this time (not a heart shaped, but lovely!). I can't get it to bloom again. Will have to research it. You ought to keep the air around it moist; a little ramiken filled with water will do the trick, as well as water in the soil. The spindly, vine-y things that grow from the base love moist air. Oh, and they also love warm sun. Our orchids bloom at least once, sometimes twice a year. Do not take them out of the pot they come in- that silly plastic thing is actually the best thing for them. Also, a south window or other sunny spot is key. The heart shape is gorgeous!